A contested region of space accessible through a known wormhole has drawn the attention of powerful forces throughout the galaxy. Both the Federation and the Klingon Empire, who share a delicate alliance at this time, have recently built outposts in the region — but now news of grave troubles brewing in the region has prompted both the Klingons and the Federation to investigate immediately. Command your ship, recruit new crew members, earn experience points, and use your skills to confront the challenges of the Star Trek universe. Explore and face a variety of challenges on a randomly built space map using the venture tile system first introduced in the award-winning game Mage Knight. 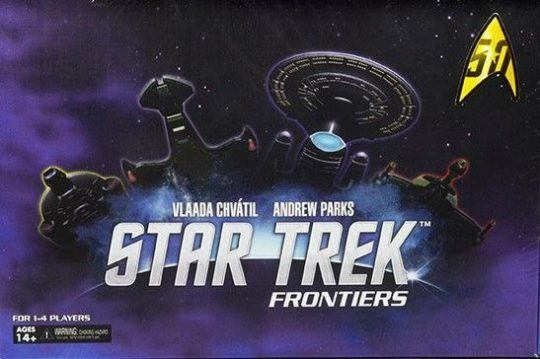 Star Trek: Frontiers is designed for 1 to 4 players with multiple competitive, cooperative and solo scenarios. Work together to defeat hostile ships or compete to explore and uncover hidden mysteries. Players need to overcome obstacles to expand their knowledge and use their leadership as they adventure in order to be victorious in their exploration!